I'm back. I guess I forgot to mention that I was gone. For the past week I was on Kelleys Island, just north of Sandusky, Ohio. Yes, we have islands in Ohio. Miracles still happen. I spent the week with eleven other writers, all wonderful people, critiquing the novels we've been working on. It was an amazing experience. I've never written a novel before, except once I tried, but I gave up pretty quickly when it became evident that the novel wasn't really a novel. Maybe someday it'll grow up to be one, but as it stands, that past attempt was a stab in the dark. This time, I feel the shape of the book I'm writing, know the characters and what they're up to, where they're going, where they've been. I know all this even better now, after the Blue Heaven novel workshop (cast includes: ringleader, Charles Finlay, Tobias Buckell, Karin Lowachee, Nancy Proctor, Cathy Morrison, James Stevens-Arce, Ben Rosenbaum, M. Rickert, Amber Van Dyk, Paul Melko, and Roger Eichorn). We stayed in a beautiful bed and breakfast, were served wonderful breakfasts and lunches, had not so wonderful dinners at the local village diner (Go Pump), encountered possible voodoo sacrifices, discussed a wide variety of topics ranging from writing to religion, from drag names to encounters with police officers. We played mafia, the Surrealist Oracle, and critiqued for about six hours a day. Now I'm back home. One more week of school left before I graduate. Two essays left to write. But a slight cold. (Thanks Toby, Amber, Karin, Ben, whomever was passing the nasty thing around). The only war I'm supporting right now is the war I've waged on the viral scum that has invaded my body. Went to the doctor yesterday. Diagnosis: tonsilitis. But he gave me the A-bomb, Augmentim, which I have been gleefully dropping on the rabid germs for the past twenty-four hours. What? No CNN coverage? It's great, though! Very entertaining! As soon as I've rid my body of the horrible viral dictator, I'll replace it with a strange old white retired U.S. general. That'll make everything better. I am so sick. This is not what I need at this juncture of the season. I have essays to write, to grade, chapbooks to design, novels to critique before next weekend, and classes to teach and attend. I feel like I've got golfballs clenched between my jaws. My throat feels like its in a vice. Jackie made me three dinners, put them in the refrigerator, and then left to see if she could cop some antibiotics. She did, but they aren't doing anything. That's ok, though, because while she was out, she bought me these really cool pants and a shirt and a matching hat. What an angel. My mother came over with more medicine and made me eat something, but it hurts to swallow even air. So now I have to go to the doctor tomorrow and hope he'll give me free samples of medicine to get rid of whatever this is. Ugh, I hate not having health insurance. Can't sleep, but am totally exhausted. Can't eat, but I'm famished. Picture me distaught like a victim of heatstroke and malnourishment on a deserted island. Yes, I'm over the top. But damn it, so is this virus or whatever the hell it is. A few people have wondered who Jackie is. 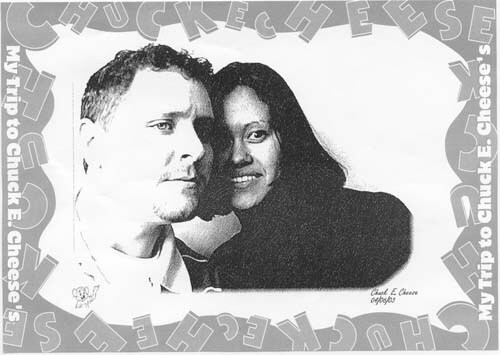 The fabulous Chuck E. Cheese took this photo for us. I wrote a story called "The Drowned Mermaid" when I was twenty-three. I'm twenty-seven now, and the story has just been published in the newest issue of Realms of Fantasy. I had moved to California at the end of the summer of 1998 with my ex-girlfriend, Regina. Her mother lives in a small beach town a half hour north of San Diego. We were planning on moving to the Bay Area after staying with her mother, who hadn't gotten to spend much time with Regina in several years, while Regina was going to college in Ohio, where we met in a course on Franz Kafka. But that's another story entirely. I'd never really been outside the midwest at that point in my life, except for when I was twelve and my aunt took me and my brothers and cousins to Florida for a week, and also little weekend vacations to places like Niagra Falls. My parents weren't travelers (although in recent years my mother has become more of one. My father only travels to other areas of the country in order to hunt). In any case, California was a strange and alien place for me. I loved being there, but I felt displaced in a way that, at the time, I couldn't explain. My mother was also very sick at the time (she told me this later, a couple months after I left) and I came to understand for the first time in my life what it really felt like to be sick for home, or for what I realize now, years later, was an idea of home. At the same time that I was feeling homesick, my ex-girlfriend was showing me the important places from her childhood. She had had a particularly rough growing up. Her parents divorced in her early teens. Her father was a drug addict. Her mother worked three or four jobs at a time, waitressing and sewing and whatever else she could get her hands on, to support Regina and her brother. When her family broke apart, Regina found a new family. The new family did a lot of drugs, particularly Crystal Meth. She became a runaway and was homeless for several of her teenage years, becoming further and further estranged from her mother and father and brother. There's more to this story that informed the story I wrote later, but it isn't my story to tell beyond this point. Between my emotional displacement and longing for home and family, and Regina's stories of a childhood without a home, on a night when we snuck into a private beach where rich people lived in these grand old beach houses on the sides of a cliff, with decks overlooking the ocean, an image came to me that would try to contain some of these emotions and experiences and ideas that were filling me. At the private beach, I saw several people sleeping rough under one of the decks of the wealthy beachfront property owners. I remember asking Regina, "What are those people doing in sleeping bags?" She said, "They're just staying the night, they're homeless." It struck me as ironic that they would sleep under the feet of the wealthy in their wonderful houses--how appropriate. I kept looking out at the beach and I saw--I swear it--a tail flip in the waves and disappear. I may have imagined it, I don't know, but I saw it, real or imagined. I thought of mermaids then, and remembered that a chapter of J.G. Ballard's Hello America was titled, "The Drowned Mermaid". In the chapter though, the drowned mermaid was just the Statue of Liberty, which had toppled and was at rest at the bottom of the ocean now (it was a post-apocolyptic America novel). I started to wonder how a real mermaid might drown. It would be hard, I thought, because they breathe water, so how would they drown? Then I started thinking about famous drownings, like Virginia Woolf, who filled her pockets with rocks and stepped out into a river. What is home? I was wondering. Where is it? I was wondering. How do you get there? Or conversely, how do you escape it? Why do we leave home? Why do we come back to it? I still wonder about these things, often. I decided everything was too close to the bone for me to write about directly, so when I returned home myself that Christmas, and was met by my crying mother at the airport, arms open, welcoming me back, telling me, "I'm so glad you're home. When you left, it felt like you had died. Your father had a terrible time about it. For a while, I had to help him, I couldn't even be upset because I had to help him," I decided to stay in Ohio again. (My parents are ok about me moving great distances now, thankfully, so I don't have to worry about them anymore if I leave again in the future). In order to get enough distance on the materials I needed to write about, though, I decided I'd tell it from the points of view of a couple who I imagined lived in one of those beach houses, those houses that looked so safe and sound, protected by their money. At that point, all the other ideas, images, stories and mythologies I'd been thinking about, gravitated towards them, Paul and Helena, and the story was written. A side note: Why were my parents so upset that I'd leave home for the other side of the country? A lot of people don't understand their extreme emotional response to this, because it's an anachronism, really. Many people expect their children to grow up, and go to college, and move away. But I grew up anachronistically in a small farm town where the nineteen fifties existed side by side with the present, and matters of the rest of the world reached me through books and television. My parents had grown up there. Their parents had grown up there, or in a town next to it. My parents built a house next to my father's parents. My oldest brother has built a house for his family next to my parents. My other older brother lives a mile down the road. Aunts and uncles and cousins all live within several miles of each other. The family is very communal, its roots in farming and steel mills. Ironically, the town is called Kinsman. Analyze that for a second. But for someone like me, who has a natural curiousity about the rest of the world, it's been difficult, because that curiousity conflicts with how I've been taught to be a person in a family. When I left for Michigan a year after returning from California, my middle brother told me, "You don't even want to be part of this family, do you?" Of course I did. But I also wanted other things that I couldn't get if I stayed. For a while, they didn't understand that. I think they understand that now. If they don't, they don't hassle me about it anymore. They've gotten used to my coming and going. They've stopped expecting me (at least to a degree) to fit an idea of what, for them, is normal.